Fox Video's 20th anniversary edition set contains all four Alien films in their original theatrical ratio (2.35:1, except Aliens which is in 1.85:1), with Dolby Digital 5.1 soundtracks, and enhanced for 16:9 TVs. The extra features on the box set are weighted towards the beginning of the series. 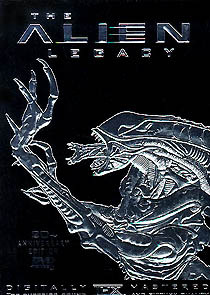 The Alien disc is replete with goodies, including a commentary track by Ridley Scott, a fresh transfer which corrects some minor discrepancies between the film’s 70mm and standard 35mm sound mixes, deleted scenes, (including some not included in the UK VHS collector’s edition box set), trailers, storyboards, artwork, poster designs and photo’s. Alien also includes two alternate audio tracks. One contains a rough sound mix, with on-set recordings and provisional music cues. The other presents Jerry Goldsmith’s superb score as he originally intended it, before Scott re-edited it, (replacing several cues with pre-existing material). It's not likely to be of much interest to anyone other than film music fans, but it reveals a largely undocumented part of Alien’s mythology, and something that only the DVD format has been able to facilitate. It’s a great shame that the other discs in the set don’t have isolated score tracks. The restored 154-minute version of Aliens is presented from a high-definition transfer that’s stripped away some of the coarse grain that’s blighted previous efforts. A 1986 interview with James Cameron and a good chunk of the “making of…” materials from the laserdisc box set provide added value, although nothing new has been unearthed. Alien³ looks much better on DVD than it did on laserdisc, and a damn sight better than the turgid VHS versions. A contemporary “making of…” featurette is the only notable bonus, missing a prime opportunity to finally release some of the notorious missing scenes, or to restore it to something resembling the director's original vision. If Fox had made more effort, perhaps they could have also got Fincher to contribute a commentary track. Perhaps then it might have resulted in the film being reappraised by its detractors. When the Legacy set was released, the dust had barely settled on Alien Resurrection, so it was inevitable that a proper post mortem wasn’t a consideration, but it’s a shame to see the disc so Spartan. A promotional featurette is included, which at least shows how some of the effects were created. The box set is priced very reasonably, so even fans who don’t particularly like the third and fourth movies shouldn’t be too wary. The discs are also available separately. Fox’s offer of a fifth, hour-long “Making of Alien” disc to customers who bought the box set was a marketing fiasco of legendary proportions. Originally planned as something that would be included in the box set, (either as a separate disc, or as an added feature on one of the other discs), it soon transformed into a fifth disc that could only be obtained through a coupon system. The fifth disc was included with the UK version. NB: This box set has been superseded by the Alien Quadrilogy box set, released in December 2003.